Questions regarding the reliability of the New Testament are commonly raised among modern biblical scholars and popular media alike. 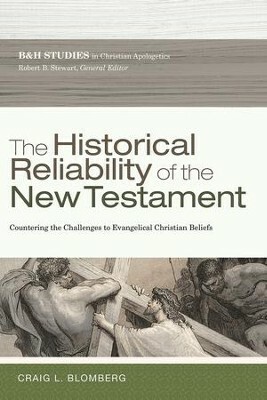 Drawing on decades of research in a fresh, comprehensive defense of the New Testament's reliability, distinguished professor and New Testament scholar Craig Blomberg addresses nearly all of the major objections to the historicity of the New Testament in one comprehensive volume, The Historical Reliability of the New Testament: Countering the Challenges to Evangelical Christian Beliefs. Blomberg contends with issues such as the transmission of the text, the formation of the canon and the Gospels, alleged contradictions among parallels, the relationship between Jesus and Paul, supposed Pauline forgeries, unique problems associated with miracles, the value and status of Revelation, and many more. His research is given in a balanced, fair, and accurate manner, revealing where he believes the historical evidence points, which is consistently in a most faith-affirming direction. Presenting historical corroborations of details from all parts of the New Testament throughout the text, The Historical Reliability of the New Testament marshals the latest scholarship in responding to objections, while remaining accessible to non-specialist. I'm the author/artist and I want to review The Historical Reliability of the New Testament: Countering the Challenges to Evangelical Christian Beliefs - eBook.